A man who is aiming to break a running world record has been given a birthday surprise in Durham, thanks to Prince Bishops Shopping Centre and the North East running community. Ben Smith is in the midst of a challenge to be the first person to run 401 marathons in 401 days, raising awareness of the issues of bullying in society and money for two charities – Stonewall and Kidscape. He celebrated his birthday today with a marathon in Durham and his route took him to Prince Bishops Shopping Centre, where he was presented with a cake and a cheque. Ben Smith’s 259th marathon followed a course in and around Durham, including sections that will feature in the first ever Durham City Run in July. This brand new event for the North East is being presented by Durham County Council in partnership with Events of the North and will see both 5K and 10K races taking place on the evening of Wednesday 20 July. Today was a double celebration, as it also saw the confirmation of Prince Bishops Shopping Centre as title sponsor for the event. Smith’s birthday route was set by leading North East athletics club Durham City Harriers and saw him visit local schools to talk about his record breaking endeavour. He was accompanied on the day by several Harriers, along with members of local running group Durham Mums on the Run and Aly Dixon, who will be representing Great Britain in the marathon at the Rio Olympic Games this summer. After running through Prince Bishops, Smith blew out the candles on a birthday cake baked by one of the centre’s tenants, Sweet Tooth Delivery. 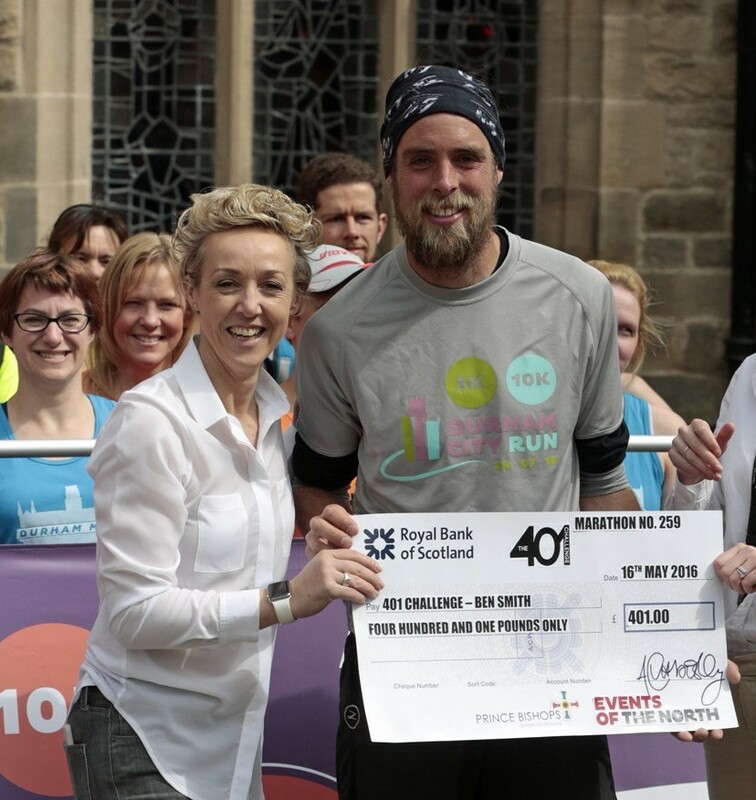 Prince Bishops and Durham City Run organiser Events of the North also handed over a cheque for £401 to help Smith on his way to his fundraising target. Cllr Maria Plews, Durham County Council’s cabinet member for leisure, libraries and lifelong learning said: “Ben’s challenge is an incredible feat of endurance and I hope his visit to Durham will help inspire local people to achieve their own fitness goals and enjoy the benefits of a more active lifestyle.